Reintroduced to the UK swim calendar five years ago, the annual meet now regularly hosts the best in GB swimming, challenged this year by the Danish and Spanish national teams and top individual and club swimmers from Norway, Denmark, Austria, Sweden, Germany and France – to name but a few. 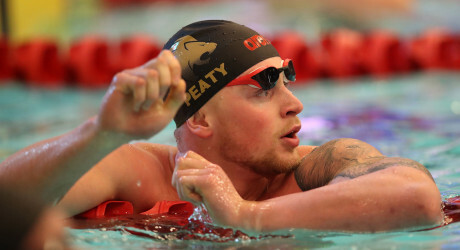 Breaststroke interest will undoubtedly centre on World record holder, Adam Peaty, who, along with his Loughborough National Centre team mate, James Wilby, will hope to keep Stirling University’s Ross Murdoch behind them. Other leading Brits attending from Bath and Loughborough National Centre’s include James Guy, Siobhan Marie O’Connor, Sarah Vasey, Tom Dean, Molly Renshaw and Luke Greenbank. Adding local interest are Edinburgh University’s Commonwealth and European Games swimmers, Lucy Hope, Kathryn Greenslade and David Cumberlidge, Aberdeen’s Hannah Miley and Stirling’s Duncan Scott, Aimee Willmott and Murdoch. A strong Danish contingent features Olympic sprint champion Pernille Blume, and fellow Olympian butterfliers, Jeanette Ottesen, Emile Beckmann and Viktor Bromer. The Royal Spanish National team includes European breaststroke silver medallist Jessica Vall and individual medley bronze medallist, Joan Luis Pons. Olympian Lena Kreundl will be hoping to take medley honours back to Austria in the female event but will have to contend with Miley and Willmott to do so. On backstroke, French national champion, Geoffroy Mathieu, will go head-to-head with Britain’s Elliot Clogg; both contested the European championships last year in Glasgow. Event organisers, the East District of the Scottish Amateur Swimming Association has developed the meet in partnership with the University of Edinburgh, City of Edinburgh Council and TYR to bring world-class swimmers to the Scottish capital. The meet provides a first opportunity this year to assess preparations for the FINA World Championships in Gwangju, South Korea. Friday evening: Men 1500m Freestyle, Women 100m Backstroke, Men 100m Backstroke, Women 200m Butterfly, Men 200m Freestyle, Women 50m Freestyle, Men 50m Butterfly, Women 400m Freestyle, Men 200m Breaststroke, Women 100m Breaststroke, Men 200m IM, Mixed 4x 100m Medley relay. Saturday evening: Men 400m IM, Women 800m Freestyle, Men 50m Backstroke, Women 50m Backstroke, Men 100m Breaststroke, Women 100m Butterfly, Men 200m Butterfly, Women 400m IM, Men 50m Freestyle, Women 50m Breaststroke, Men 800m Freestyle, Women 200m Freestyle, Mixed 4 x 100m Freestyle relay. Sunday evening: Women 200m IM, Men 50m Breaststroke, Women 50m Butterfly, Men 200m Backstroke, Women 200m Backstroke, Men 100m Freestyle, Women 200m Breaststroke, Men 400m Freestyle, Women 1500m Freestyle, Men 100m Butterfly, Women 100m Freestyle. The Edinburgh International Swim Meet has a long history in the international swimming calendar, having first taken place in the 1980s. After a three-year hiatus leading up to the 2014 Commonwealth Games, the meet returned to the RCP in 2015 and has since become hugely popular, with a variety of international teams and world-leading athletes competing. Media accreditation forms can be found here: http://www.scottishswimming.com/media/mediaaccreditation-form.aspx. Check out too twitter.com/allSportsPR and twitter.com/allEdinburghPR.